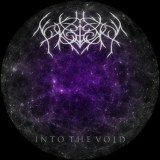 Considering this is but Feign's second demo, Into the Void is very impressive. The work of one man, Jacob Lizotte, Feign was only formed earlier this year! Comprising two long tracks and one short outro, Into the Void more than does its job of selling its creator's talents. Deathwisher begins the demo with a fade-in to slow, tolling riffs atop increasingly furious blasting. It's more aggressive than it seems, the riffs grinding away beneath a heavy layer of atmospheric keyboards and rasping vocals, which give it the feel of a rabid Dimmu Borgir at times (a good thing!). The compositional work could use a little tinkering, but it's strongly-written and melodic without losing its emotion. Soulcrusher is even better, seeming angrier and faster, with more of a melancholic feel to the riffs towards the end as it turns towards more of a black-gaze style, the layered, almost gothic riffs and keyboards working very well together. The drums cut out completely towards the end, leading into Stargazer, a clean guitar outro that's nothing unusual, but brings the demo to a close well. An impressive demo, all told. Alex was right to namecheck Agalloch and Wolves in the Throne Room in his review of the first demo, but Feign are closer to the latter here, and good enough at the moment to suggest future releases will be up there with the bigger names. Sure, there's some work to do on songwriting, but what's here so far is remarkably good for a project this new, and I look forward to hearing much more from Feign. You can hear the demo in full at the Bandcamp link above, where it's available on a name-your-price basis.